We’re knee deep into the holiday season, and just as important as all the love, family, gift giving, and hot chocolate are, the holidays are nothing without the music. So, in what has become a tradition here at WCC, we’ve compiled a playlist to help usher in this season’s greetings. Last year it was the 16 Christmas Songs to End Your Year on a High Note, and the year before it was 10 Essential Holiday Songs for Millenials. But for 2015, we’re rolling out a new list of the best holiday music, both classic and current. Read the tracklist and download the playlist below! Way back in 1993, David Foster released The Christmas Album in which he featured collaborations with some of the best in the business like BeBe & CeCe Winans, Natalie Cole, Celine Dion, Peabo Bryson, and Roberta Flack. But one of the strongest tracks on the album is the opener, a breathtaking instrumental of “Carol of the Bells”. And it’s timeless. UK singer took a Christmas classic that has been done to death, Donny Hathaway Christmas classic “This Christmas”, and made it feel brand new. How you ask? Trap. He made a trap version of “This Christmas”, and it’s genius. Gospel music’s new kids take on a Christmas classic that is forever tied to A Charlie Brown Christmas. Their harmonies are flawless, their voices are butter, and the nostalgia meter is on 10. We’ve been following Kevin Ross for years now, and we featured last year on our list of 16 Songs to End Your Year on a High Note. Now officially a Motown signee, he has toured with Ne-Yo and Maxwell, and on “Season of Miracles” off of his EP The Coldest Winter, Ross is living proof that the classic Motown sound is still alive and well. I’m shocked that recently released Christmas With Friends hasn’t received more coverage as it is a collaboration between the queen India Arie and deceased music legend Joe Sample. Plus, it is filled with the most insane features (so many I had to pull two songs from the collection and add them to this list). Here, India and Brandy’s voice duel and lay over each other to create harmonious euphoria. The best acapella group on the planet does it again. On “The First Noel” each member of Pentatonix gets a moment to take the lead vocal spot, but it is the layering of their voices that will cause the chills. It’s haunting. It’s operatic. It’s beautiful. Joe has stayed in the game for ages, and there is a reason for that. His voice is incomparable. His tenor is also tailor made for a mellow modern jazz version of “The Christmas Song”. In 2015, Tori Kelly rocketed from YouTube fame to star of her own Pepsi commercial campaign. She just received a Grammy nomination for Best New Artist, and she more than holds her own here dueting with India Arie. If you haven’t had the pleasure of experiencing her pipes, take a listen. Those Braxton girls finally got it together and recorded an album together. 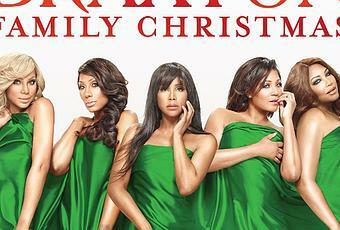 Sure, it is only a Christmas album, and there is almost zero promo work being done for it, but Braxton Family Christmas is a solid collection of both standards and original compositions. And I swear every time these sisters sing together, an angel gets its wings. Enjoy the songs and don’t forget to download the complete playlist HERE! Next story Why Aren’t the ‘All Lives Matter’ People Outraged About Ethan Couch?